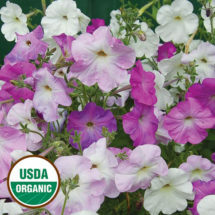 The beautiful, soft-petaled, many-colored heirloom petunia is a flower straight from our childhood. Start them indoors and set out after all danger of frost has passed. Old-fashioned varieties are particularly fragrant. Perfect for containers and hanging baskets. Will take partial shade especially in warmer areas. 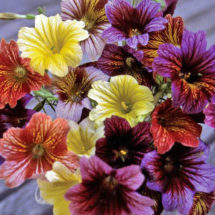 Dwarf plants produce a bounty of brightly-colored flowers in many colors. 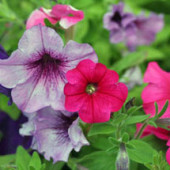 This attractive mix of colors is ideal for hanging baskets and borders. Very aromatic! 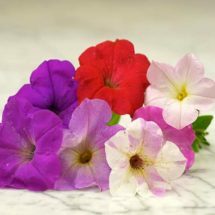 Sturdy 12 to 24-inch tall stems with striped flowers in a wide range of colors.